1 What's The New Twitch Extension? 2 Why Install the Extension? 3 Should You Also Use Sprout Social? 4 Why Use Sprout Social? What's The New Twitch Extension? Should You Also Use Sprout Social? Twitch changed the game when it comes to creating online communities. What was once a platform known for the live-streaming of video game playing, Twitch has since become the go-to medium for live-streaming just about anything. From eSports to real sports, from watching vintage TV shows to sharing music and art, there’s a Twitch channel for just about any interest. In fact, their substantial growth in popularity is probably why Amazon was willing to spend $970 million dollars to acquire Twitch in 2014. 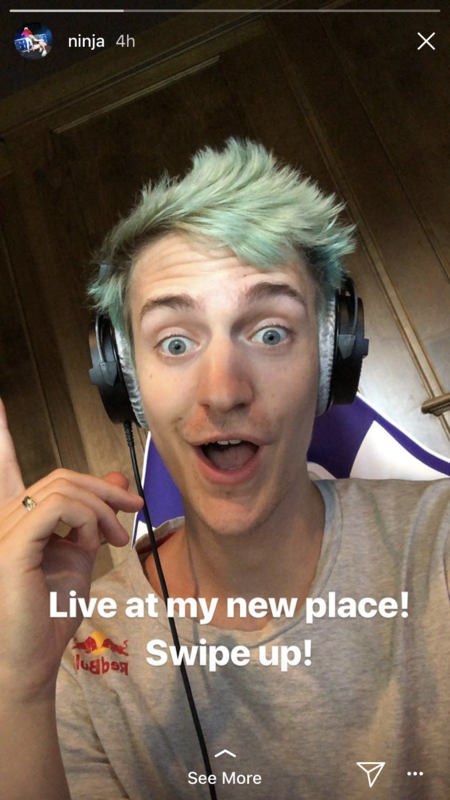 Since then competition to become the next big streamer has grown intense as content creators look to become the next superstar like Ninja, a video game streamer with over 9 million followers and an average live viewership of 95,000 users. And those who can create a large Twitch community gain substantial benefits. Whether you become a certified Twitch partner, find your own sponsors, generate direct donations from fans or sell your own merchandise, the opportunity to leverage Twitch to supplement your company’s income or create a new income is substantial. And for those game creators building out a Twitch presence, there is additional benefits in increasing sales and player retention. But growing your Twitch following can be tough. That’s why Sprout Social is excited to announce our Twitch partnership and new Twitch extension: Live Twitter Feed. Sprout Social and Twitch have partnered to create a new extension allowing streamers and game developers to scale their Twitch and social media presence. 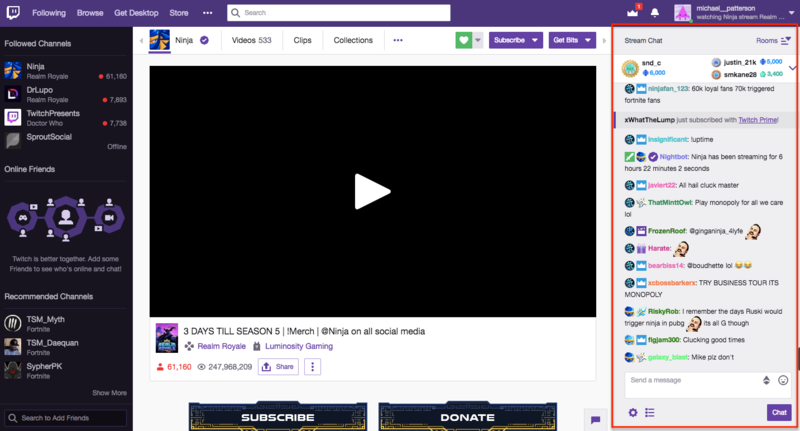 Twitch and Sprout Social partnered to create a Twitch extension streamers can use to share messages with their viewers. When a broadcaster downloads the Live Twitter Feed extension it is then added to their Channel page, the place viewers come to watch them broadcast. 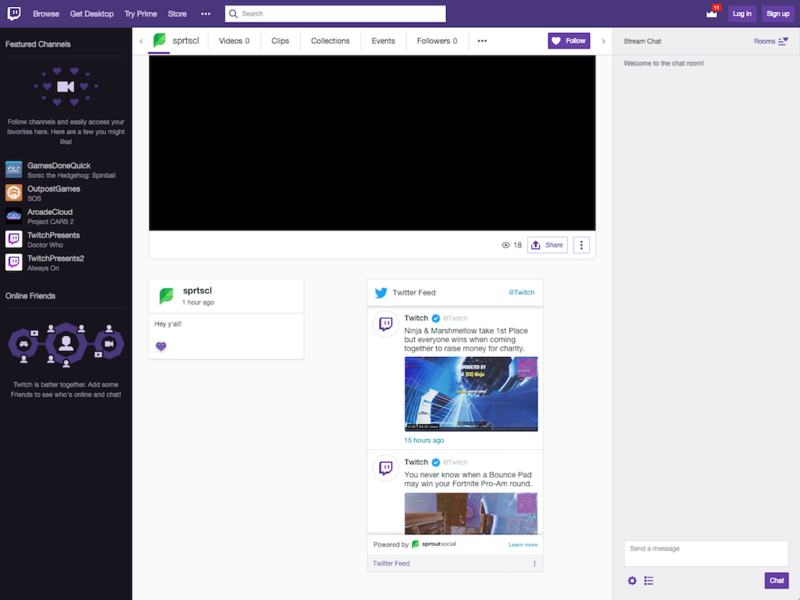 While the broadcaster is live, Sprout’s Twitch extension will pull all of their Tweets into an extension on their Channel page so viewers can keep up with all of the broadcaster’s key messages. While most users currently have a link to their Twitter page from their channel, those links are limited to static images like the one below. This new extension format is the first of its kind to create a rich experience right from a users Channel by actually sharing the latest content and encouraging users to visit the streamers’ Twitter page. The extension is different from the normal “Stream Chat” that viewers and streamers use to communicate with one another during streams (seen below). This is instead a way for just the streamers to share announcements and any other content to their Channel. 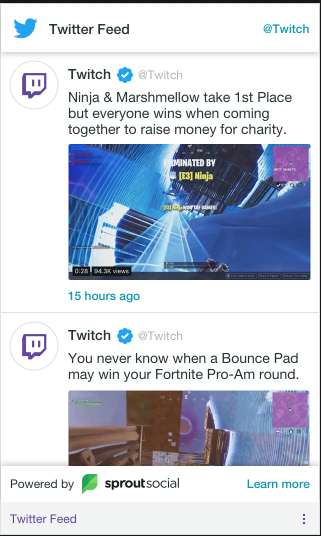 This makes it simple to share engaging content to Twitch and Twitter simultaneously, increasing user engagement and viewership. Learn how installing our new extension can help you increase viewership, audience engagement and overall revenue. Whether you’re a company that develops and markets your own video games, or a content creator looking to increase your Twitch presence, these are the key factors to help you succeed on Twitch. A portion of streamers’ revenue comes from the number of individuals who tune in live for a stream. In fact, in order to become a Twitch partner you need to maintain a certain number of live viewers on each individual stream. To increase the number of viewers you have for your broadcasts you need to inform viewers when you’re going live. Here’s where the Live Twitter Feed extension comes in handy. 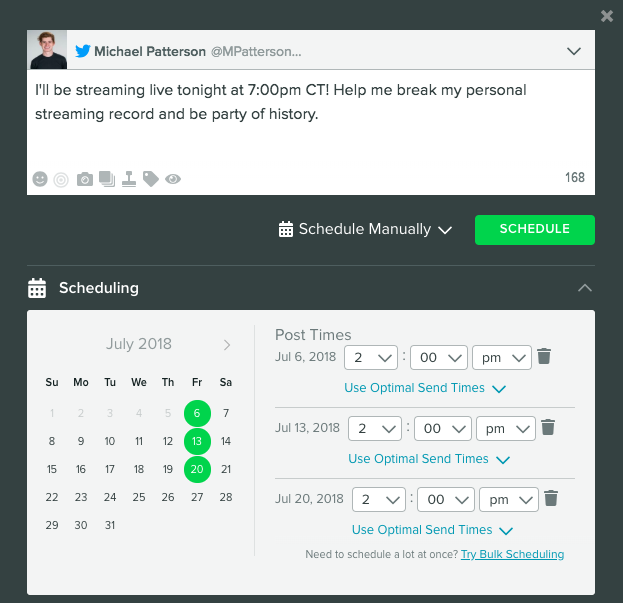 Instead of simply sharing your streaming schedule to your Twitter or Twitch page individually where only a percentage of your social following lives, you can publish to both pages simultaneously alerting users when you’re going live. Here’s an example of an engaging way streamer DrLupo announced an upcoming stream. Another example is seen from Twitch star Ninja. 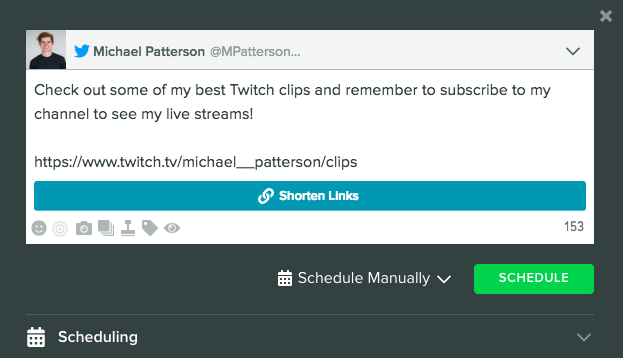 Before you close out your live stream you can share another announcement telling users when you’ll be live next and how to connect with you on other social media channels. This way viewers know to tune-in next time and also follow your Twitter presence for additional messages between shows. 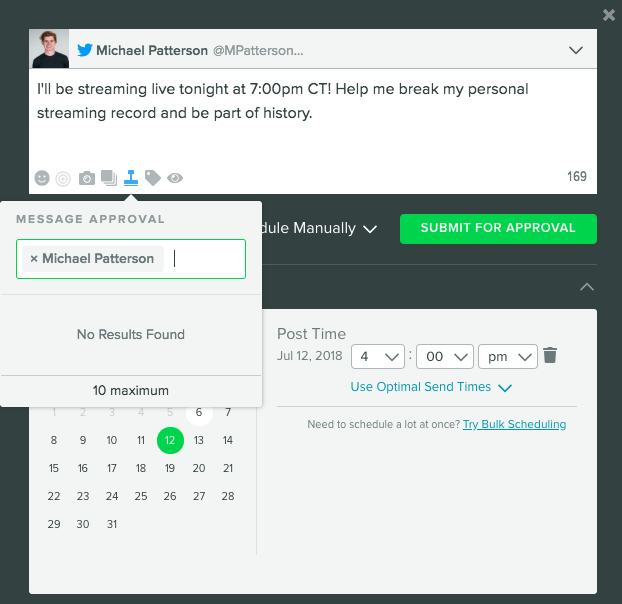 We get into scheduling all of your messages in advance in the section on using Sprout Social. One of the reasons viewers love Twitch is the interactivity during broadcasts, so content creators should consistently create and send messages during live sessions. One of the key benefits of doing so with the Live Twitter Feed extension is that when you post your commentary directly to Twitter, you not only reach your Twitch audience with the extension but also take advantage of the additional reach of your Twitter audience. Try including relevant hashtags or Twitter handles to increase your reach and subsequently the number of people viewing your live sessions. Your target audience isn’t just on Twitch. It’s likely that they visit a number of different social media platforms to follow their favorite brands and influencers. Cross-promoting your individual social media pages is a great way to increase your following and overall social footprint. Once you push Twitch users to Twitter or Twitter users to Twitch, it’s more likely they’ll be exposed to your other social channels and follow you. You can then leverage those channels to tell viewers when to tune-in to your broadcasts. You see links to social media profiles on almost all Twitch Channels. This is just a more interactive way to get viewers to click through to your channels to follow you. Learn how Sprout Social can help you across all of your social channels. Including the ability to manage multiple accounts, schedule messages and run social analytics. Sprout is a social media management platform that makes it easy for streamers and video game companies alike to grow their social following and engage with their audience. Here are just a few of the tools that can help you improve your social marketing and grow your audience on not just Twitch, but across every social media platform as well. For all of our features check out our page on Social Media Marketing. Engaging with your fans is critical to growing a loyal social media audience. By simply responding to a message one viewer sends you you can make their entire day. But keeping up with all of these messages is a challenge, especially as you scale your presence. That’s where the Sprout Social Smart Inbox comes in. Stream all of your messages from all of your social media profiles to a centralized location to ensure you never miss a message. If you’re managing multiple social media pages, whether that’s for individual games in your catalogue or if you’re publishing content for multiple online personalities, it’s extremely beneficial to create specific content for each channel, since each channel has different content, different schedules and different clips to share. Let’s look at Twitch as our prime example of an organization with multiple channels. There’s Twitch and TwitchPoker just to name a few. It’s likely that each of those audiences differs based on the type of broadcasts the channel creates. In order to create more relevant messages to share on their channel, each of their channels may have their own unique Twitter presence that streams messages to those specific pages. So while Twitch’s core Twitter page shares information on the platform as a whole, TwitchShow shares content specific to their poker broadcasts. Using Sprout, all of these messages for all of these platforms can be scheduled from one centralized platform. You probably don’t want to log in to each social profile every time you’d like to send a message. Especially if you’re managing the presence of multiple accounts. With Sprout Social, you don’t have to. Within the Publishing section of Sprout Social you can easily compose and schedule messages to send at multiple times. Below is an example of a message you can schedule on days you plan to stream. Do you know your streaming schedule well in advance? Easily schedule the same message to send multiple times to ensure your social audiences know when to join. Your streaming schedule is an example of content that should be scheduled at a specific time. However, there may be some posts you’d like to share to your Twitch and Twitter pages that can publish whenever. For example, times you’re encouraging users to come check out some of your best clips. This is the perfect time to use Sprout Social’s patented ViralPost technology which automatically posts at the times your audience is the most engaged and likely to read your messages. Let’s say you’ve attached your social profiles to Sprout Social and you want to see all of the messages you’ve scheduled across all of your profiles. 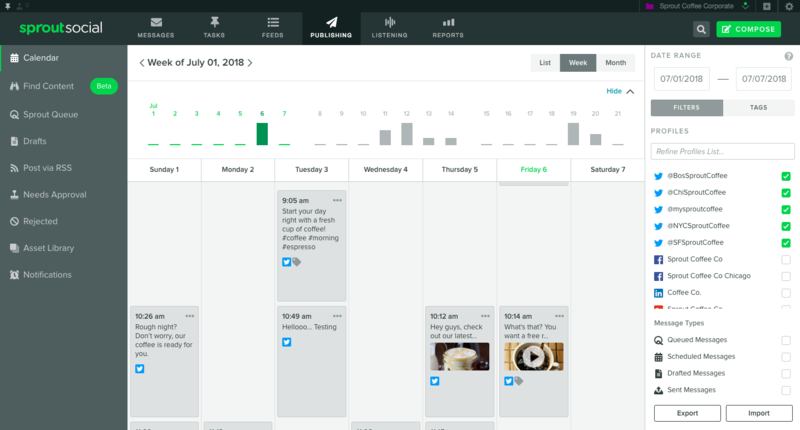 Sprout Social’s Publishing Calendar makes it easy to see at a glance how many messages you have lined up. Choose as many or as few of the accounts the you’d like to see at the time. This will also show the messages that you’ve Queued with Viralpost. Dig in by day or week to see all of the content scheduled for each day. Notice a lapse in content on days that you know you’d like to share something with your viewers? Quickly double-click the day in question to open the Compose Window and create something to send! If you’re creating content that will need additional approval before sending, or if someone is publishing on your behalf and you’d like final say over what is sent, Sprout Social offers Advanced Permissions. Let’s use the scheduled message from our Publishing Calendar as an example. If I’m posting on Michael Patterson’s behalf I can assign it to him (the broadcaster) as the final approver to make sure he is comfortable with this post discussing breaking his streaming record. Michael will then receive an email and in-app notification asking him if he approves this message for approval. Michael can then Approve, Reject, leave comments or tag additional users for more feedback. The best way to find out the kind of content your audiences wants to see is by looking at what has worked in the past. With Sprout’s Social Media Analytics, you can do just that. 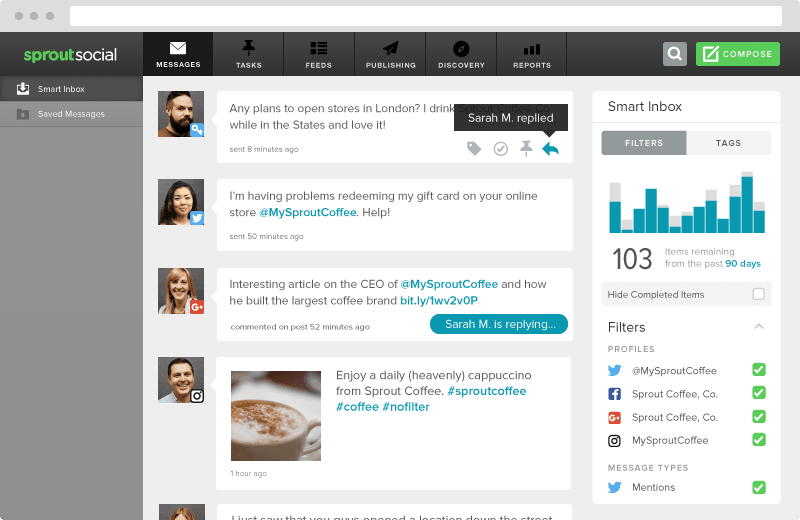 Using the Sprout Social Sent Messages Report you can sort your social messages by the most reach, responses or clicks. Use that knowledge when deciding what kind of content to create. These are just a few of the features that benefit Twitch streamers. For more information on how Sprout can help your organization fill out the form below and someone from our team will be in touch shortly. Sprout Social offers a variety of social media tools that help not just streamers, but businesses and influencers in general. Tell us about yourself and we'll be in touch shortly! Ready to dive in? Get started with your own Sprout Social trial today and start growing your viewership! Think Sprout Social could be a good fit for you? Here’s how you can get started leveraging all of our social media marketing tools today. 1. Go to our pricing page and choose the plan that fits your needs. The first 30 days are totally free and you won’t be asked to enter any payment information or download any software. 2. Enter your name and email information to create your free trial account. 3. Click the button to attach a Twitter profile to your account. 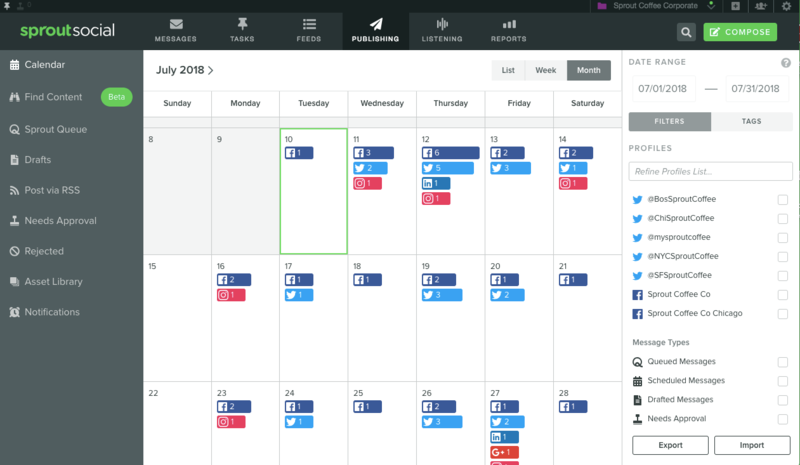 This is necessary to start scheduling your content and looking at your social media analytics. 4. (Optional) Add more accounts to your profile to schedule across other profiles and networks. 5. Tell us a bit more about your business interests and start exploring the tool on your own or with a tour! Need additional assistance getting yourself setup on Sprout Social? Fill in the information below and someone from our team will be in touch shortly! Learn how Sprout Social's social media management can help you grow your Twitch following and online presence.